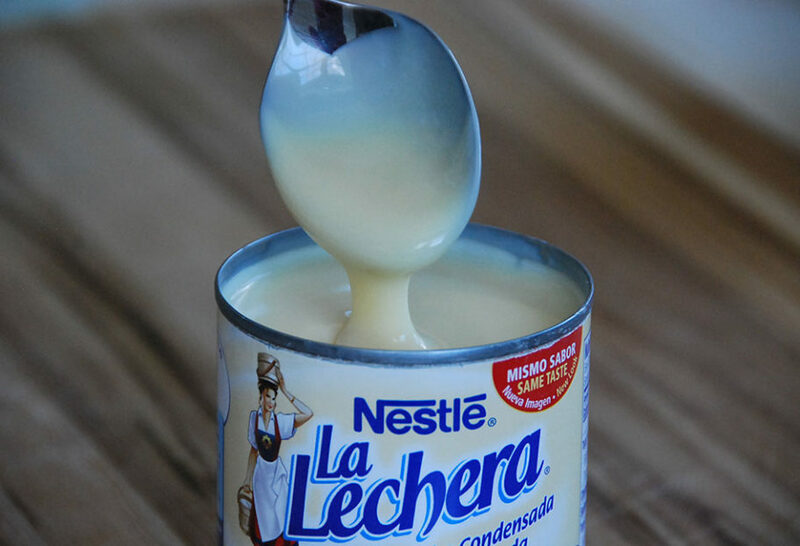 I grew up in Mexico City with sweetened condensed milk in my family’s pantry. It is an ingredient that is part of my upbringing, it speaks of home to me. We had it not only for breakfast, dessert, milkshakes, smoothies, snacks and after school treats (drizzled over fresh fruit or spread over Maria cookies). We also poured it on top of baked plantains and sweet potatoes (in my view, it’s all they need to take them to the stratosphere), which in my memory remains one of the sweetest things. It was part of our everyday lives. My mom and dad worked full time during the week, but my sisters and I always had a flan, pound cake or gelatina to look forward to. Every day of the week. Now, many years later, I feel so lucky to have it in my American pantry too. I love making those traditional sweet things that nurtured me growing up for my boys, now that I have a family of my own. And we also have so much fun coming up with new recipes and modern spins too! Yes, for sure, the kitchen gets a lot messier when I am concocting things with my boys, but we have such good times together in the kitchen. The boys get so involved, and to be honest, they have fabulous ideas. Juju and I are now playing with a take on lime pie with fluffy meringue on top. Will keep you posted! Why an ingredient like this is so versatile comes as no surprise: it is made with whole cow’s milk. The water is removed, hence the condensed, and sugar is added. It was originally a way of preserving milk, to spread the health benefits of that ingredient to more people and also to make it convenient. You can have it handy for so many uses in your pantry at anytime. Right now, I am sitting at my desk in my office, working away, writing blog posts for you and editing recipes. I am doing so while sipping a strong cup of coffee sweetened with a drizzle of sweetened condensed milk. Like I do every morning. Sweet. why do you add sweetened condensed milk to your recipe of Carnitas? It’s so good…you should try it Ophelia! Love your show, Patti! Before cutting the cable cord, I paid attention to what I was really watching on TV. A lot of PBS. Smart shows – like Patti’s Mexican Table! That all the ingredients aren’t found in north central Wisconsin hasn’t stopped me from kitchen-adapting and becoming one of your biggest fans. Thank you, Carol! Sooooo happy to hear this!! I was born in Argentina but mostly raised here in the states. Dulce de Leche made from sweetened condensed milk is my all time favorite. I recall my babbie adding this to coffee just like you do Patti. I love your cooking show. Although, since I keep kosher, I adapt many dishes using beef or chicken. Mine, too! Thank you, Deborah!! Loved the tv show with the cheesrcake with yoursons how can i. Get the recipe.it lookrd scrumptious. My wife and I are new watchers of your TV program and enjoy it very much. I ordered you book yesterday and probably my question will be in the book, but I noticed when you asked your children how often you have beans for dinner, they replied 6 and when you go out to eat you often have beans then too. My question has to do with keeping the beans “fresh.” We use a slow heat pot to cook the beans and they are great the first night and not bad the next morning, but after a couple of days they thicken, and even if I had water, the kids don’t want to eat them. How do you keep your beans fresh, or do you make the beans and rice every day? Hi David, Thank you for watching and for writing to me! The beans should keep in the refrigerator for a few days in a tightly sealed container. I also like to turn the leftovers into pureed beans and refried beans (links below) — they are good in corn tortillas, in tacos, on tortas, in soups, etc. Condensed milk is a huge part of Thai culture as well. Here we drink it in coffee and tea (hot and col) as well as use it in desserts, cakes, cookies, even some dishes like curries. So interesting!! Thank you for sharing, Rachel! Pati…were you looking in my pantry?? I have 2 cans of La Lechera just sitting there waiting to be used. I didn’t grow up with it, but when I spent a summer in Guadalajara after high school, my Senora always offered it to us with our cafe, pan tostada, fruits,etc. I am going to open a can en la manana, and use it! I just poured a splash in my coffee, again! I love La Lechera, I put it in my coffee and te de canela, is delicious. I also eat it with un bolillo o telera. By the way, I have your book and I love it too. I have cooked so many recipes and everyone has enjoyed the dishes. I would love to attend one of your classes in DC. Please keep me posted with the upcoming dates. Hola Paty,mi mas grade recuerdo es que cuando estaba chica jugaba con mis vecinas a que preparabamos “pastel” con una semita de las mas grandes y le poniamos encima La Lechera, jajaja que recuerdos. Claro que mi mama hacia gelatina de mamey con La lechera y los platanos tambien. Que ricos recuerdos. Muchas gracias por llevarme a esa epoca ya que ahorita tengo mas de 60 anos, asi que ya hace un buen tiempo de eso. Un fuerte abrazo para ti y que sigan los exitos. Yes, I come to LA frequently. Hopefully we can meet at an event the next time I am there. I am so glad your daughter has come to my classes in DC! I came across your show by mistake but what a great one it was. I am a Mexican American living in the United States and to me there is nothing better then the Lechera on pan tostado in the morning with milk or coffee. I was wondering if you have the recipe or know of one for Carlota? Just curious since you are talking about Lechera and galletas Maria. In a previous job we had a lady that did this desert but we have yet to find a good one online to be like the one my co-worker use to make. Please help. Thank you! and keep up the great work. I grew up with condensed milk too after my mother was done with her breast milk. I could spoon it into my mouth or put it on a cracker, yummy! I know it is fattening so be careful not to overeat. I love to have a breakfast recipe using condensed milk too. Please let me know if a recipe is available, either by you or Pati. I love sweetened condensed milk on crackers, too! What is pan tostado? I Googled it & only got how to make tortilla shells.